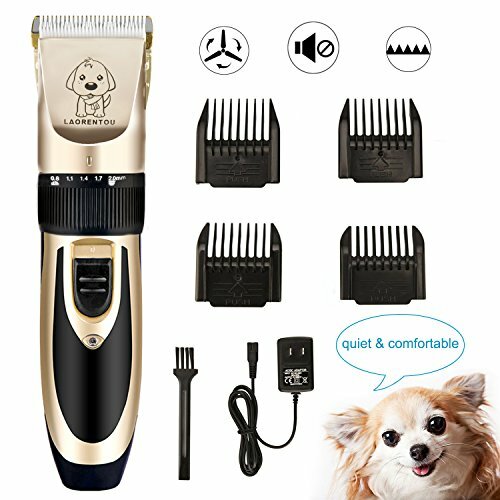 The pet clipper is designed for dog trimmng and grooming,fine to medium pet hair and fur for dogs, cats and other pets. We Intend to Provide Customer with quick pet grooming experience at home. Pet Grooming can Comprehensively improve the pet's overall appearance and enhance organisms immunity. 0.1 Titanium acute-angle blade combining with the ceramic movable blade,more smooth and efficient cutting. 0.2 High-power motor, low vibration and not loud design,will not scare your pet. 0.3 Comes with accessories of 3-6-9-12mm level limiting combs,more safe for your pet,even though you try it for your first time. 0.4 Mobile titanium blade is adjustable for the range on 0.8-2mm hair length. 0.5 Grooming about 70 mins on a single charge and recharging will just take 4-5 hours.The clipper also can be electrified while using . Q :Does the clipper ever get hot in hand while grooming? A :No and the battery lasts quite a bit. Q：Compared to Andis, Wahl, Oster, how well does this clipper work? A ：This is very easy to use,you will like it. ❤【Sharp Cutting Edge】Sharp and efficient, a titanium alloy cutting edge and a ceramic moving edge,In addition, because the blade advances at high speed, it is efficient, it can last long without much heat, and it is difficult to clog hair. cut pets hair by yourself. you can save time and money. And the top design is obtuse, it does not hurt even if you touch the skin. ❤【Updated Motor Structure Low Noise】Updated with special denoise technology, reduce noise to below 60db (below eu standards),Just make a smooth humming sound while using,won't scare your pets, pets will not afraid of hair cutting any more. If you have any questions about this product by GLEIM, contact us by completing and submitting the form below. If you are looking for a specif part number, please include it with your message.